Augustus to Constantine and Ancient Coins In-between | Skinner Inc. Ancient coins, especially those from early Roman and Greek cultures, have been captivating the interest of collectors for centuries. The recent slews of coin hoards being unearthed all across Europe have made international headlines, causing resurgence in their popularity. Most recently, a construction crew in Spain happened upon 1,300 pounds of bronze Roman coins, dating from the 3rd century AD, stashed in amphoras, while digging a trench. Stories like this drive people’s curiosities, not only about the prospect of finding treasure, but what that treasure entails. Exposure from these treasure troves, especially those of ancient coins, compels people to take interest, creating new collectors. It’s easy to see why. Apart from depictions of rulers for self promotion and commemoration, ancient coins employed mythical figures and scenes. These images are still popular today and contribute greatly to their sale prices. 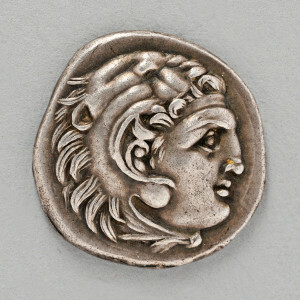 Lot 1001B in our Discovery – Interiors online auction is an attractive Alexander the Great silver drachm. The obverse shows a well struck head of Heracles donning a lion headdress, the reverse of a seated Zeus with eagle and staff. Not only is the quality of engraving and attention to detail striking, but the level of relief is impressive, even by today’s standards. In the May Discovery – Interiors online auction, our coin and currency selection is vast, sampling from American and European specimens, to our own hoard of nearly 1,200 identified Roman and Greek ancients (Lot 1000). From graded and raw Augustus, Caesar, Marc Antony, and Vespasian coins to early American large cents and Morgan dollars, you’re likely to find something you have been searching for or be surprised by something you haven’t. 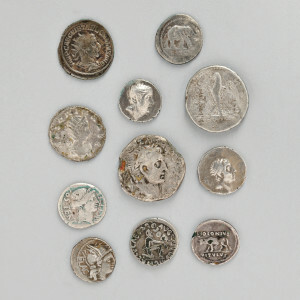 See these coins and more at in-person previews for the Discovery – Interiors online auction on Tuesday, May 17 from 12PM – 5PM and on Wednesday, May 18 from 10AM – 7PM in our Marlborough, MA gallery. This entry was posted in Blog and tagged American large cents, ancient coins, ancient currency, antique coins, antique currency, auction, coin auction, coins, currency, drachm, Greek coins, marlborough, massachusetts, Morgan dollars, online auction, Roman coins, skinner, skinner auctions by Kyle Johnson. Bookmark the permalink.